It was partly the words of Jim Morrison, but mainly the Whisky Lounge that led us up to the Island of Islay in Scotland. We had taken our vans to a wet and windy Beacons Festival 2014 last year and it is there we had properly discovered the delights of Whisky. The Whisky Lounge was set up in order to educate the world about the “water of life” and the how best to drink it. They ran several events at Beacons Festival and had an amazing set up complete with Chesterfield chairs and settees and a whole lot of top quality whisky. We enjoyed it so much, we attended several of their talks over the course of the weekend. is Laphroaig. Back in 1994, they started a little club called The Friends of Laphroaig that entitled people to have their own square foot of land on the island and claim ground rent each year of a dram of whisky. Now up to 700,000 members from 100 countries, Islay continues to be a pilgrimage for whisky fans of the world. When the opportunity arose to go and check out Islay and cash in the ground rent, we jumped at the chance. We booked the Ferry crossing from Kennacraig, which was a very pleasant and bargainous, complete with Islay Ales and whisky. We set off early, drove up through Glasgow, through picturesque lochs and pine forests past beauty spots including Inveraray. 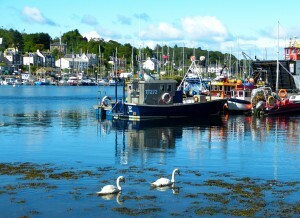 We stopped for a couple of hours in the beautiful village of Tarbert Loch Fyne, waiting for the ferry. This is a lovely spot and a chance to see a small Scottish castle and try the delights of the deep fried Mars bar (we drew the line at salt and vinegar with it). 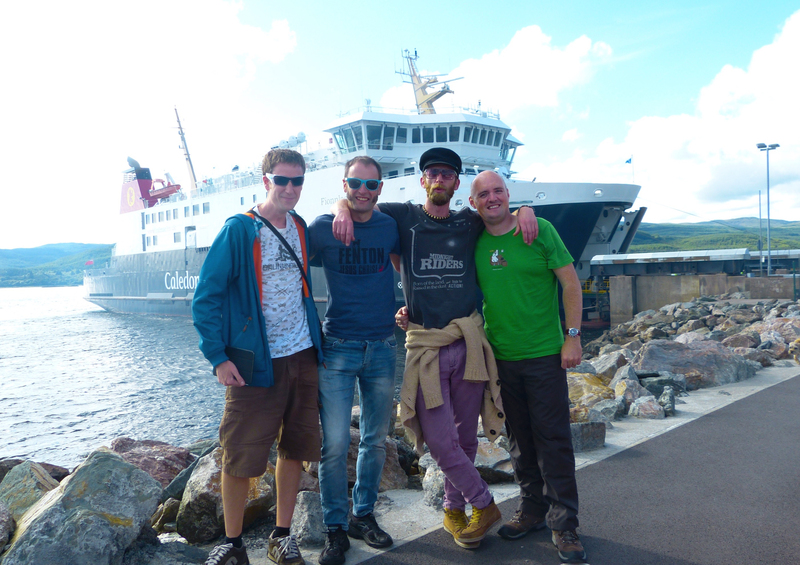 We drove up and boarded our relatively small car ferry and set sail for Islay. Dolphins jumped by the side of the boat and the sun shone. 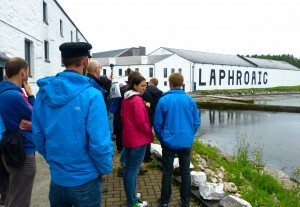 We arced around the island of Islay swinging past three of the distilleries on the South coast, Laphroaig, Ardbeg and Lagavulin with their distinctive white and black lettering. Disembarking onto the Island, we drove through Port Ellen up to our campsite at Port Charlotte. 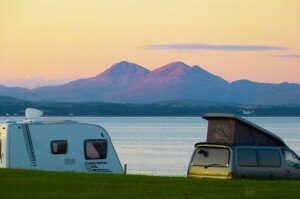 The Port Mor campsite at Port Charlotte is a real cracker, right on the coast with people camped around a football pitch. There are plenty of facilities and a café on site also. The sun set, casting a pink glow on the peaks of nearby island Jura as we got pitched up with the waves lapping against the nearby shore. trip to the Scottish islands would not be complete without rain though and true to form, the next morning, the heavens opened and didn’t close again for the remaining three days of our stay. 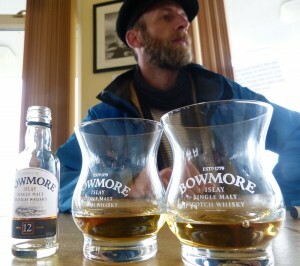 We were prepared though, so the next day, we got our waterproofs out and got our designated driver to drive us to the Bowmore distillery. 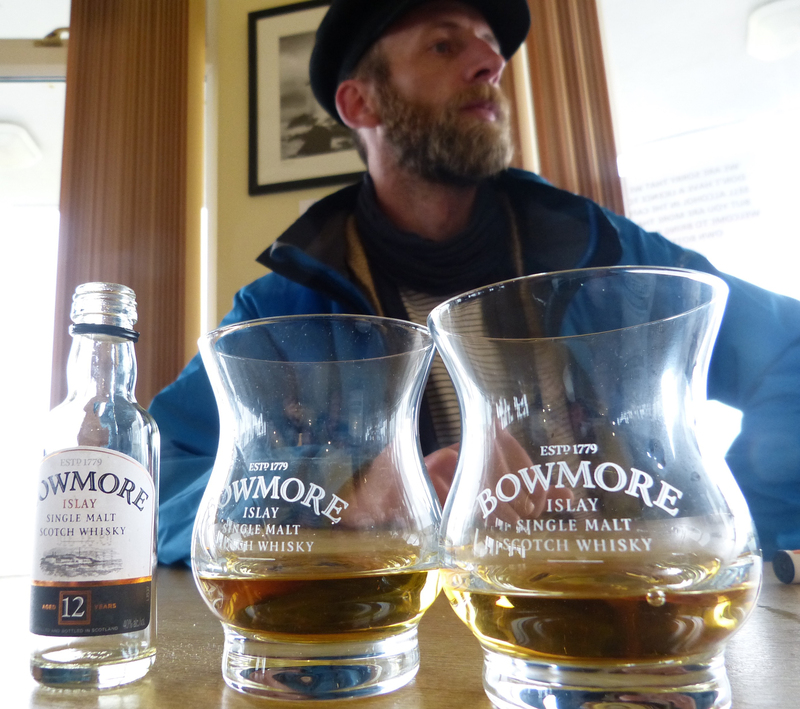 A friend described Bowmore as ‘doing it in style’ and he wasn’t wrong, it’s a great place to visit. 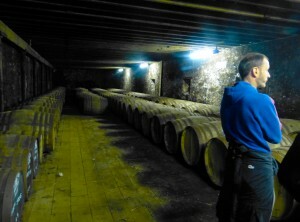 The tour guide was a young lady who certainly knew her whisky. She guided us around the distillery talking about the process, the people and the rich history of Bowmore as Islay’s first whisky, officially founded in 1779. We saw bottles worth £6000 and £100,000 where several bottles of the latter had recently been sold to charity. 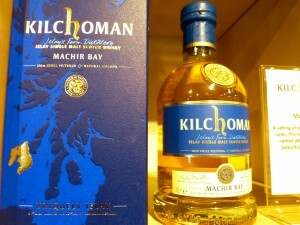 The tour ended with some blind tasting, which was lots of fun and then up to the lovely whisky bar to try a bit more. We had finally been shown the whisky bar we’d been looking for. On the Sunday evening, we headed back to the local pub and we were blessed with some incredible local music featuring fiddles, flutes and accordions. We were even treated to an incredible solo song in Gaelic as an ode to the men of Islay going off to the World war. Along with a local tipple, this was heaven. Enjoying a whisky or two is pretty important to the enjoyment of Islay – but it does have more to offer with its quaint towns, ancient landmarks and local entertainment. For gin lovers, a less well known fact is that Islay produce an excellent tipple called the Botanist using 22 local botanicals and distilled with the same love and attention as some of the more famous island drams. 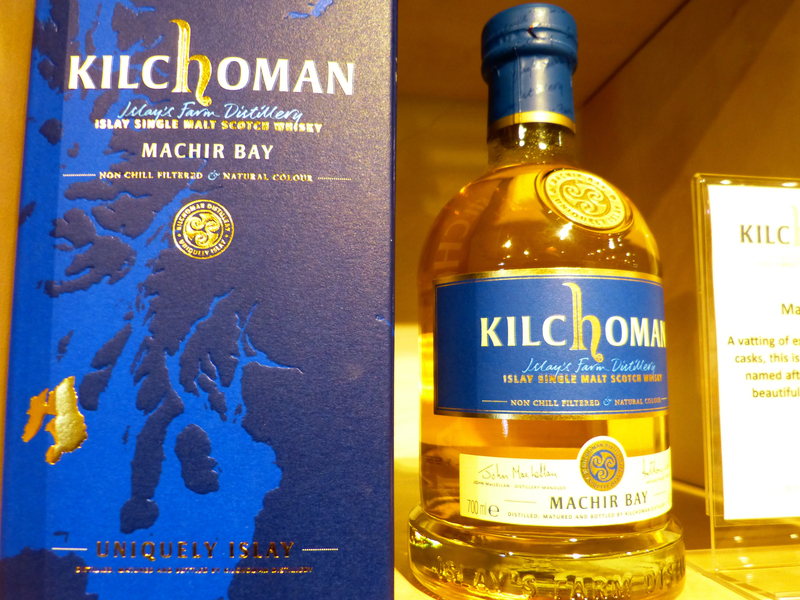 On Monday, the buses and distilleries were a little more flexible, so we set out early to try the whisky of the Kilchoman distillery. This is a relatively new set up, only ten years old but had some incredible Whiskies to offer. The tours or tastings tend to be between £3 and £6 depending on the distillery and time of year. 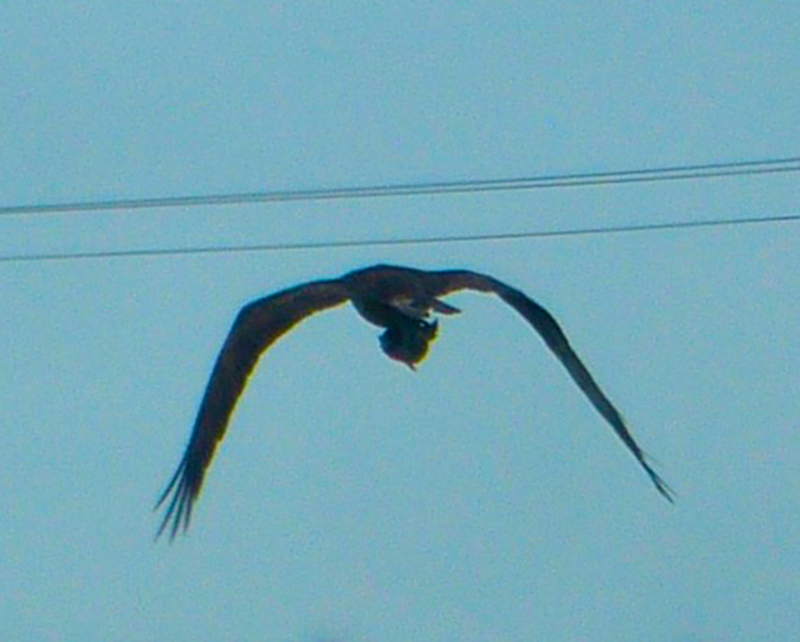 We sped back to the Bruichladdich distillery where the Botanist gin is also made and spotted a Golden Eagle carrying its prey over the countryside, flapping its huge wings along the side of the road. for cleaning and maintenance for a couple of weeks. Because of this, the tour was half price at just £3 and it was an incredible insight into how Laphroaig go about creating their 3 million bottles of peat smoked whisky each year. We were able to try several types of Laphroaig before and after the tour at no extra cost and had a commemorative glass each. When we asked about the friends of Laphroaig club, we were duly presented with a miniature bottle of Laphroaig 10 year as ‘ground rent’ and a certificate with a map containing the exact location of the plot of land. The idea is to grab a pair of wellies and a flag of your choice and then locate your patch of land to add the flag to whilst drinking your dram. This bit didn’t quite work this time as we realised we’d spent all of the time sampling the delights of Laphroaig and had completely run out of time for anything else before we had to hot foot it for the bus. Narrowly flagging down the bus, we managed to get back to Port Charlotte in one piece and went for our tea in the splendid hotel there before trying some of the whiskies we hadn’t previously had time for. As we packed up first thing in the morning, the rain continued to pour down, but we were already figuring out the logistics of when, how and who with our return visit might include. 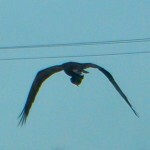 There were several things we had missed or would love to share with more of our friends. Islay itself is quite flat and there are other islands that would win out on scenery and landmarks. Despite this and the weather though, we had an incredible time and can’t wait to return to the whisky bars, pubs and distilleries of Islay.